Russell, Samantha and Siesmaa, Belinda 2017. The experience of forensic males in dialectical behaviour therapy (forensic version): a qualitative exploratory study. The Journal of Forensic Practice, Vol. 19, Issue. 1, p. 47. Abdelhamid Gado, Gamal 2016. The Effectiveness of Dialectical Behavior Therapy on Reducing Symptoms of Borderline Personality Disorder: Case Study. International Journal of Social Science and Humanity, Vol. 6, Issue. 1, p. 47. James, Sigrid Freeman, Kim R. Mayo, Danessa Riggs, Matt L. Morgan, Joshua P. Schaepper, Mary Ann and Montgomery, Susanne B. 2015. Does Insurance Matter? Implementing Dialectical Behavior Therapy with Two Groups of Youth Engaged in Deliberate Self-harm. Administration and Policy in Mental Health and Mental Health Services Research, Vol. 42, Issue. 4, p. 449. Robinson, Robin A. and Ryder, Judith A. 2014. “Sometimes One Does That With Blinders On”: Revisioning Care for Violent Girls. Women & Criminal Justice, Vol. 24, Issue. 3, p. 193. Lenz, A. Stephen Taylor, Rebecca Fleming, Molly and Serman, Nina 2014. Effectiveness of Dialectical Behavior Therapy for Treating Eating Disorders. Journal of Counseling & Development, Vol. 92, Issue. 1, p. 26. Amner, Karen 2012. The Effect of DBT Provision in Reducing the Cost of Adults Displaying the Symptoms of BPD. British Journal of Psychotherapy, Vol. 28, Issue. 3, p. 336. Feigenbaum, Janet D. Fonagy, Peter Pilling, Stephen Jones, Alan Wildgoose, Amanda and Bebbington, Paul E. 2012. A real-world study of the effectiveness of DBT in the UK National Health Service. British Journal of Clinical Psychology, Vol. 51, Issue. 2, p. 121. Feigenbaum, Janet 2010. Self-harm – The solution not the problem: The Dialectical Behaviour Therapy Model. Psychoanalytic Psychotherapy, Vol. 24, Issue. 2, p. 115. Rossiter, Rachel and Black, Jodie 2009. Challenging therapeutic pessimism: borderline personality disorder and co-morbid substance abuse1. Mental Health and Substance Use, Vol. 2, Issue. 2, p. 140. Blennerhassett, Richard Bamford, Lindsay Whelan, Anthony Jamieson, Sarah and Wilson O'Raghaillaigh, Jennifer 2009. 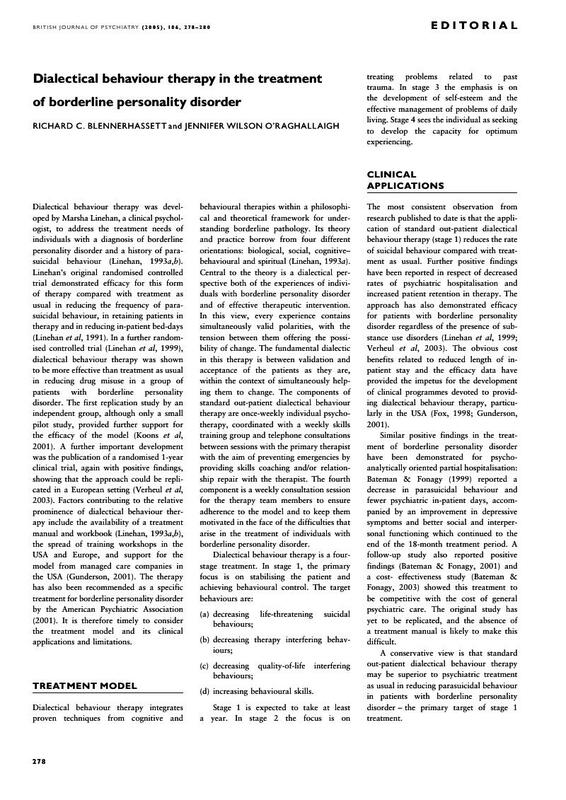 Dialectical behaviour therapy in an Irish community mental health setting. Irish Journal of Psychological Medicine, Vol. 26, Issue. 02, p. 59. Schalast, Norbert 2009. Drogenabhängige Patienten im Maßregelvollzug gemäß § 64 StGB: Verbesserung der Quote erfolgreicher Behandlung durch suchtspezifische Medikation?. Forensische Psychiatrie, Psychologie, Kriminologie, Vol. 3, Issue. 4, p. 294. Peritogiannis, Vaios Stefanou, Ekaterini Damigos, Dimitrios and Mavreas, Venetsanos 2008. Admission rates of patients with borderline personality disorder in a psychiatric unit in a General Hospital. International Journal of Psychiatry in Clinical Practice, Vol. 12, Issue. 1, p. 78. James, Anthony C. Taylor, Annie Winmill, Louise and Alfoadari, Kielly 2008. A Preliminary Community Study of Dialectical Behaviour Therapy (DBT) with Adolescent Females Demonstrating Persistent, Deliberate Self-Harm (DSH). Child and Adolescent Mental Health, Vol. 13, Issue. 3, p. 148. Feigenbaum, Janet 2007. Dialectical behaviour therapy: An increasing evidence base. Journal of Mental Health, Vol. 16, Issue. 1, p. 51. Brown, Kirk Warren Ryan, Richard M. and Creswell, J. David 2007. Mindfulness: Theoretical Foundations and Evidence for its Salutary Effects. Psychological Inquiry, Vol. 18, Issue. 4, p. 211. Daffern, Michael and Howells, Kevin 2007. Aggressive Behaviour in High-Risk Personality Disordered Inpatients During Prison and Following Admission to Hospital. Psychiatry, Psychology and Law, Vol. 14, Issue. 1, p. 26. Zinkler, Martin Gaglia, Amy Arokiadass, S. M. Rajagopal and Farhy, Eldad 2007. Dialectical behaviour treatment: implementation and outcomes. Psychiatric Bulletin, Vol. 31, Issue. 07, p. 249. American Psychiatric Association (2001) Practice guideline for the treatment of patients with borderline personality disorders. American Journal of Psychiatry, 168, 1–52. Bateman, A. & Fonagy, P. (2001) Treatment of borderline personality disorder with psychoanalytically oriented partial hospitalization: an eighteen month follow-up. American Journal of Psychiatry, 158, 36–42. Bateman, A. & Fonagy, P. (2003) Health service utilization costs for borderline personality disorder. Patients treated with psychoanalytically oriented partial hospitalization versus general psychiatric care. American Journal of Psychiatry, 160, 169–171. Evans, K., Tyrer, P., Catalan, J., et al (1999) Manualassisted cognitive–behaviour therapy (MACT): a randomised controlled trial of a brief intervention with bibliotherapy in the treatment of recurrent deliberate self harm. Psychological Medicine, 29, 19–25. Fox, T. S. (1998) Integrating dialectical behaviour therapy into a community mental health programme. Psychiatric Services, 49, 1338–1340. Gunderson, J. G. (2001) Borderline Personality Disorder: A Clinical Guide. Washington, DC: American Psychiatric Publishing. Hawkins, K. A. & Sinha, R. (1998) Can line clinicians master the conceptual complexities of dialectical behavior therapy? An evaluation of a State Department of Mental Health training program. Journal of Psychiatric Research, 32, 379–384. Koons, C. R., Robins, C. J., Bishop, G. K., et al (2001) Efficacy of dialectical behavior therapy in women veterans with borderline personality disorder: a randomized controled trial. Behavior Therapy, 32, 371–390. Linehan, M. M. (1993a) Cognitive Behavioral Treatment of Borderline Personality Disorder. New York: Guilford. Linehan, M. M. (1993b) Skills Training Manual for Treating Borderline Personality Disorder. New York: Guilford. Linehan, M. M., Armstrong, H. E., Suarez, A., et al (1991) Cognitive-behavioral treatment of chronically parasuicidal borderline patients. Archives of General Psychiatry, 48, 1060–1064. Linehan, M. M., Heard, M. L. & Armstrong, H. E. (1993) Naturalistic follow-up of a behavioral treatment for chronically parasuicidal borderline patients. Archives of General Psychiatry, 50, 971–974. Linehan, M.M., Schmidt, H., Dimeff, L. A., et al (1999) Dialectical behavior therapy for patients with borderline personality disorder and drug dependence. American Journal of Addictions, 8, 279–292. Scheel, K. R. (2000) The empirical basis of dialectical behavioural therapy; summary, critique, and implications. Clinical Psychology: Science and Practice, 7, 68–86. Tyrer, P. (2002) Practice guideline for the treatment of borderline personality disorder: a bridge too far. Journal of Personality Disorders, 16, 113–118. Verheul, R., Van Den Bosch, L. M.C., Koeter, M.W.J., et al (2003) Dialectical behaviour therapy for women with borderline personality disorder: 12-month, randomised clinical trial in The Netherlands. British Journal of Psychiatry, 182, 135–140. Can dialectical behaviour therapy go community?